There are hundreds of major-league players who fall into the nebulous category of having had a “cup of coffee” in the big leagues; a baseball idiom for a short time a minor-league player spends playing in the major leagues. It could be for a single game, or a few short weeks. The time period is undefined, but there is one player who holds the unique distinction of pitching and winning a game in his major-league debut — never to pitch in the majors again — and then returning to the majors the following season to play one inning as an outfielder, never to bat or field in the majors again: meet Elmer Ward Bliss. At Dubois the 6-foot, 180-pound Bliss took a sudden interest in baseball and, finding a talent for the game, he signed on with the Elmira Pioneers (New York) team in the Atlantic League, playing shortstop from April until the league disbanded on June 14.3 Needing employment, Bliss settled in Bolivar, New York, where he dressed tools for the oil industry during the morning shift and honed his ability as a baseball pitcher in the afternoon, hurling for Bolivar and other nearby town teams.4 Attaining recognition for his pitching prowess the red-headed right-hander signed on with the Cortland/Waverly Wagonmakers and the Utica Pentups of the New York State League in 1901. Exactly which team he played for — perhaps both — and for how many games, is uncertain, but it would not be the last time Bliss signed more than one contract with more than one team in a season. Feeling secure at making a living at baseball, Bliss and Miss Gertrude Lebar were united in marriage on Saturday April 12, 1902, and the following Monday Bliss left Bolivar to join the Utica team for his second professional season.5 In early June the new Mrs. Bliss joined her husband in Utica, where he was in the midst of pitching in 30 games for the Pentups.6 Complete minor league records with which to entirely judge Bliss’s performance for the years 1900-1904 are unavailable at this time. 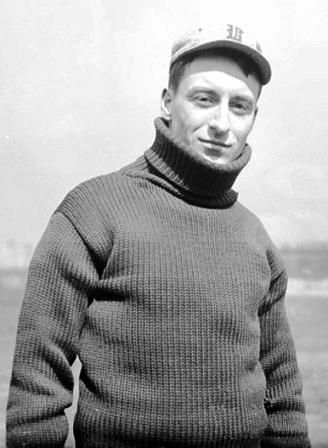 During the following spring training with the Highlanders in Albany, Georgia, Bliss pitched well and when the team headed north, Elmer had made the big club. However, inexplicably on May 4, 1904, without allowing Bliss to pitch to a single major league batter, the Highlanders released him with ten days’ advance notice and the team retaining his services during that time while advising the press that the club had too many good pitchers and no room on the roster for Bliss.10 On May 11, in a 4-3 win against the Cleveland Naps, manager Griffith sent Bliss out to right field for an inning and an at-bat. Highlander Willie Keeler had been tossed from the game for arguing an interference call in the first frame and Red Kleinow, ordinarily a catcher, replaced him in right field. In the late innings Bliss took over for Kleinow in right.11 Was this gesture of Griffith’s a farewell gift or did the Highlanders need an outfielder in a pinch? Kleinow’s innings in the outfield were his only appearance in the garden in his eight-year career. Since Kleinow was most often a backstop, it is possible Griffith wanted a more agile defender in right at the end of a close game. Disappointed with being cast off by New York, Bliss returned to his residence in Richburg, New York, near Bolivar. But apparently Bliss was a hot commodity and he quickly signed with the Albany Senators of the New York State League, the Montgomery Senators of the Southern Association, the Montreal Royals of the Eastern League, and the Baltimore Orioles of the Eastern League. Bliss went to Baltimore in early June, but Albany cried foul and said they had seen him first. Albany looked to Highlanders owner Frank J. Farrell to make a decision as to which team now owned the pitcher’s services.12 Whether Farrell did make a decision about where Bliss should play for the rest of 1904 or whether Farrell had any authority to make that decision is unclear. In the end Bliss played for Baltimore, Montreal, and the Rochester Bronchos in 1904, although records are unavailable to determine how many games he played with each. While enjoying his fine baseball summer in Grand Rapids, Bliss’s entrepreneurial spirit rose again as he and James J. Cameron entered into a partnership to build a roller polo rink and put a team in Muskegon, Michigan for the National Polo League.15 Professional roller polo was all the rage in the upper Midwest in the early part of the twentieth century; a game played indoors in winter on roller skates; similar to hockey, only played with a hard rubber ball instead of a puck.16 Within a few years the fad ran its course with the advent of basketball as the number one winter sport. Bliss had previous experience with roller polo as he and Grand Rapids owner/manager John Ganzel, a former teammate on the New York Highlanders, were already co-owners of an indoor polo team in Jackson, Michigan.17 Bliss also found his name in the newspapers for auto speeding in Grand Rapids in August 1905.18 Since automobiles and speeding tickets were in their infancy, one can imagine that this infraction may have caused a lot of talk around the Orphans ball grounds. Bliss held out for a salary increase in the spring of 1907, but finally was persuaded by new owner Phil Arnold to join Grand Rapids for the 1907 campaign.20 In the middle of a fine season in which he posted a personal 14-9 won-loss record as a pitcher, Bliss took over as manager of the Wolverines from Cuppy Groeshow on June 12.21 The team would go 60-77 under the combined efforts of both managers. Maybe thinking that his career in baseball was coming to a close, Bliss, drawing on his previous experience as an oil-rig builder, had a well drilled on his father-in-law’s property in Richburg, New York in February 1909.23 Whether the speculation was a success or failure is not recorded, but Bliss did report back to Montgomery (now known as the Climbers) and fashioned a fine 14-7 mark on the mound. However, in February 1910, Montgomery traded Bliss to the Mobile Sea Gulls for Liz Torrey and cash considerations.24 Apparently the deal fell through as records show Torrey played with Mobile in 1910. The year 1912 brought no professional offers for Bliss’s baseball services but he continued to play ball over the next couple of years in and around Hornell while operating his billiards parlor. On September 9, 1913, Elmer and his wife Gertrude were divorced. In March 1914, Bliss ran into trouble when he was arrested and fined $100 for permitting gambling at his Idle Hour Pool Parlor.26 That winter the Class D Interstate League formed with franchises from Bradford and Warren, Pennsylvania, and Hornell, Olean, Jamestown, and Wellsville, New York. Bliss expected to play and manage the Hornell entry but that fell through, likely due to the gambling situation, and it was not until June 25 that Bliss got back in the game when the Wellsville Rainmakers, sitting at the bottom of the league, hired Bliss to manage for the rest of the schedule.27 Bliss did little twirling that year but he hit .323 in 30 games. The team finished at the bottom of the standings in the second half with a record of 21-27. In February 1915 Bliss sold his pool and billiard room and moved from Hornell to Bradford, Pennsylvania to open the Bliss Insurance Agency: “When You See Bliss Don’t Think of Insurance, But If You Think of Insurance — See Bliss.”28 The same month, in Cattaraugus County, New York, Bliss wed Miss Jayne B. McQuistion of Rixford, Pennsylvania, and on June 2 at the Methodist Episcopal Church in Angelica, New York, they exchanged vows again. They would have one son, Albert Austin, born in June 1916. Bliss would successfully operate his insurance agency until he sold the business in 1950. Over the years he would be a devoted supporter of Bradford baseball teams and a sometime executive in their semi-professional and professional endeavors, usually as team secretary. On August 30, 1952, Bliss was invited to Yankee Stadium for an Old Timers game and to see the Yankees play the Washington Senators. Clark Griffith, the Senators president, and Bliss’s 1903 manager with the New York Highlanders (forerunner to the New York Yankees), introduced the five remaining living players of that team, stating that Bliss was a top flight hurler.29 That moment would be the highlight of Bliss’s later years. Elmer Ward Bliss died in Bradford on March 18, 1962; at his death he was the last living member of the original 1903 New York Highlanders. In addition to the sources cited in notes, the author also consulted Retrosheet.org, Baseball Reference.com, and Ancestry.com. 1 “The Elmer Bliss Agency Here Grows,” Bradford Era, (Bradford, Pennsylvania), December 29, 1941: 14. 5 “Vicinity Letters,” Bolivar Breeze, (Bolivar, New York), April, 17, 1902: 5. 6 “Vicinity Letters,” Bolivar Breeze, June 5, 1902: 5. 7 “All The Sports.” Fort Wayne Daily News, April 16, 1905: 7. 8 “Yesterday’s Baseball,” New York Times, September 29, 1903: 10. 9 “In Old Allegany,” Bolivar Breeze, October 22, 1903: 3. 10 “Little Breezes,” Bolivar Breeze, May 12, 1904: 8. 11 “Yesterday’s Baseball,” New York Times, May 12, 1904: 10. 12 H. L Fry, “Albany Claims Bliss,” The Sporting News, June 4, 1904: 1. 13 “The Elmer Bliss Agency Here Grows,” Bradford Era, December 29, 1941: 14. 14 “Bliss Goes to Grand Rapids,” Bolivar Breeze, April 13, 1905: 1. 15 “Sports,” Fort Wayne News, July 24, 1905: 5. 16 Karin Cramer, “Roller Polo,” Herald Bulletin, (Anderson, Indiana) July 30, 2011: 1. 18 “Bliss Fined For Auto Speeding,” Fort Wayne News, August 16, 1905: 8. 19 “Short Sport Items,” Evening Herald, (Traverse City, Michigan), September 25, 1906: 6. 20 “Arnold Getting Team,” Evening Herald, (Traverse City, Michigan), February 18, 1907: 6. 21 “Today’s Game, “Newark Advocate, (Newark, Ohio), June 12, 1907: 6. 22 “Richburg Ripples,” Bolivar Breeze, June 18, 1908: 7. 23“Latest Oil News,” Bolivar Breeze, February 4, 1909: 1. 24“Montgomery Trades Bliss,” Constitution, (Atlanta, Georgia), February 22, 1909: 10. 25 “Elmer Bliss Is Hero,” Bolivar Breeze, August 3, 1911: 1. 26 “Bliss Pays Fine,” Allegany County News, (Whitesville, New York), March 12, 1914. 27 “Bliss To Manage Wellsville,” Wellsville Daily Reporter, (Wellsville, New York), June 27, 1914: 8. 28 “Classified Business Directory,” Bradford Era, January 31, 1933: 10. 29 “Ex-Major Leaguer of Bradford Honored,” Bradford Era, September 1, 1952: 9.